RinseKit introduces the LUX, a brand new soft tote design. It’s got 50% more spray time than the original RinseKit (up to 8 minutes on the center setting) and is full of features. The hot water sink adapter is included! 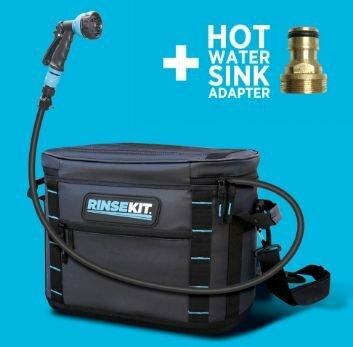 The Eon™ pressure chamber has two 1 inch accessory ports to accommodate RinseKit’s upcoming accessories – a heater system that plugs into a car accessory adapter and a hand pump system which allows users to fill and pressurize their unit remotely – without access to a hose bib or sink. The LUX has 2 outside pockets, a shoulder strap, a quick access double zipper top and 2 side handles for convenience when loading it into a vehicle. Adding to it’s versatility, the LUX doubles as a soft cooler. The full zip top allows the pressure chamber to be easily removed allowing the Tote to be the perfect cooler when it’s time to chill some beers.